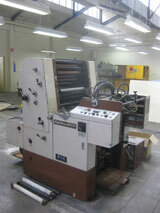 Specifications : Fuji 52 N+P Heavy Duty 15"x20" with Numbering and Perforating,Conventional Dampening. Specifications : Heavy Duty Single colur Size 28" x 40" Roland RKH 3B High Pile Delivery.Conventional Dampening. Specifications : Heidelberg Sord. (Black) Serial No.500xxx Low Imp,Conventional Dampening. Specifications : Heidelberg Sorm 502xxx 20.5"x 29.5" Stream Feed Orginal Heidelberg Feeder Max.Speed 10,000 Imp/Hr,Conventional Dampening. Specifications : Size: 47cm X 65cm, Lowest Power Consuming, Weight 3000Kg, Speed 12000/SPH, Oil Bath, DC Drive, 1 Color Offset Press, Conventional Dampening. Specifications : Sr.#: 314745, Size: 18" x 22 1/2". Specifications : Sr.#: 1635, Size: 14 1/2" X 19". Specifications : Size: 580mm X 440mm, Lowest Power Consuming, Weight 2400Kg, Oil Bath, DC Drive, 1 Color Offset Press. Specifications : Sr.#: 1396, Size: 14 1/2" X 19".